André Boehman, a world leader in fuels and combustion research, started his academic career as an Assistant Professor of Fuel Science at the Pennsylvania State University in 1994. He was promoted to Associate Professor with tenure in 2000 and Professor in 2006. Over the years, Boehman has developed a very strong research program at Penn State and built an outstanding record of high impact journal publications in energy and fuels engineering. He is a recipient of the 2009 John Johnson Award for Outstanding Diesel Engine Research and the 2009 Arch Colwell Award from the Society of Automotive Engineers. He has also demonstrated excellent leadership in serving the professional community; serving as Editor in Chief for Fuel Processing Technology and holding executive committee positions in national and international organizations. Boehman is a Fellow of the Society of Automotive Engineers. 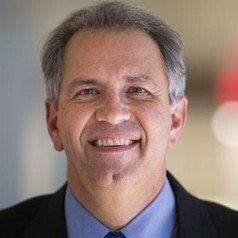 At the University of Michigan, he researches automotive engineering issues including: fuel production and formulation, alternative fuels, diesel combustion, spark ignition combustion, autoignition, spray behavior, particulate emissions, NOx emissions, emissions control, and the thermodynamics of energy conversion systems.